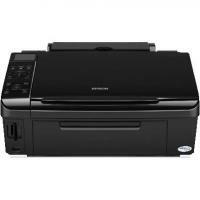 Epson SX415 is a low cost and stylish printing device for home and small office users. The multifunctional printer boasts attractive features including, PictBridge ports, colour LCD screen display, and multiple storage cards (CompactFlash, SDHC, MMC, Memory Stick Pro and xD memory cards) slot. The printer is capable of providing high-quality prints with maximum resolution of 5,760x1,440 dpi, with the help of its high yield EPSON SX415 ink cartridges. The printer weighs approx. 5.8kg and measures 450X342X182cm. The printer has an A4, Contact Image Sensor (CIS) scanner with an optical resolution of 1,200 x 2,400ppi. It also has a 6.3cm large LCD display screen along with a neat button control panel on the top. It has a rear paper feed tray with the capacity of 120 sheets. The device uses four individual ink cartridge system and has only USB connectivity. The Epson SX415 is a basic multifunctional printer that offers high-quality outputs for printing and scanning both. It can be good choice for home users who are looking for a good quality printer for regular home printing tasks. However, the printer lacks many advanced features like, wireless connectivity, direct printing, ADF, and fax functionality, which makes it a poor choice for any small office or professional user. You can also opt for the Epson T0715 multipack for your EPSON SX415 to save more on printing costs. How to install Epson SX415 ink cartridges? When the ink cartridge finishes, the printer will show a message on the LCD screen. See which cartridge has to be replaced and press the OK button followed by “Replace Now”. If you choose to replace the ink cartridge before any message appears on the LCD screen the press the Setup button. From the menu select Maintenance option and then the Ink Cartridge Replacement option. Lift the entire scanner unit up and open the cartridge cover. Lift the tab of the cartridge that has to be replaced. Now lift the cartridge to remove it. Shake the new cartridge pack gently about four to five times. Make sure you do not shake the cartridge once opened as there is a threat of leakage of ink. Take the cartridge out of the package. There is a green chip on the cartridge. Do not touch it as it may hamper the printing performance eventually and may lead to the drying out of the print head. Remove the yellow tape from the cartridge. Gently place the new ink cartridge into the slot and push it till you hear a 'click'. Close the cartridge cover and lower the scanner unit. Once you do this, the print head will move to its home position. The printer will begin charging the ink. This process will take about 2.5 minutes after which a confirmation message will appear on the screen. The printer is now ready for use. Always remember that the original Epson SX415 ink cartridges will give the best print results. You will be able to purchase the replacements online. Q. What is PictBridge port connectivity? A. PictBridge connectivity allows your printer to directly print images via your digital camera by connecting it to the printer without requiring a computer. It is a very convenient feature for photographers as they do not have to use a computer to print their images. Epson SX415 printers are enabled with this feature. Q. What are the memory cards that are compatible with Epson SX415 printers? A. You can use a CompactFlash, Microdrive, Memory Stick, MagicGate Memory Stick, SD card, MultiMedia card and xD- Picture card with your SX415 printer to print images directly from the memory card without the need for a computer. Q. I have run out of black ink for my Epson SX415 printer. Is it possible for me to buy only black Epson SX415 ink cartridges from your website or do I have to buy all the colours together? A. You can choose to buy the ink cartridges individually or in multipacks. We provide individual Epson SX415 ink cartridges of all colours and all sell them together in multipacks. According to your needs, you can buy the ink cartridges individually or you can buy them in multipacks. Q. Can I choose to buy 5 black Epson SX415 ink cartridges and 1 ink cartridge of every other colour in a multipack of 8 ink cartridges? A. Yes, you can choose your own preferred combination of colours when buying multipacks. Multipacks are most suitable for users who perform loads of print jobs and have high ink requirements. They are way cheaper than buying the ink cartridges individually. Q. I placed an order for Epson SX415 on Friday evening. By when can I expect the ink cartridges to be delivered to me? A. You will receive your ink cartridges by Monday, as our delivery service only serves from Monday to Friday. In case your order is urgent, you can contact us on 048308332211 and we will try our best to deliver the product to you as soon as possible. Q. Can I take photo copies using EPSON SX415? A. Yes, it is an All-in-One device that supports copying, scanning and printing. Q. Are compatible EPSON SX415 ink cartridges environment friendly? A. Yes, all our compatible ink cartridges are environment friendly. They are made from recycled cartridges that were used previously resulting in very little usage of new materials or components. This helps in conservation of the environment. We specialise in the remanufacturing ink cartridges and have spent years perfecting the techniques for providing our customers with the best quality compatible cartridges. Q. Can I print directly from my camera without using a computer? A. Yes, you can print directly from your camera, if it is compatible with PictBridge. Q. Does EPSON SX415 support WiFi connectivity? A. Unfortunately, this printer does not support Wifi connectivity. A. This printer cannot be used to print on CDs and DVDs. Q. I am looking to order a multipack of EPSON SX415 ink cartridges. How much time will you take to deliver it? A. All our orders are delivered by Fastway Couriers. Approximately 90% of our orders that are received before 12 noon daily are despatched on same day and delivered on a 1 - 2 delivery day basis. Fastway couriers will deliver between the hours of 9am - 5pm (Monday - Friday) However, if your need is urgent, you can call us on 048 30833221. There are times when we are unable to keep our promise of 1-2 day delivery due to a rural location or Fastway couriers’ network distribution. Q. What interfaces can be used to connect to EPSON SX415? A. The only interface that can be used to connect to EPSON SX415 is USB 2.0. Q. How many copies can EPSON SX415 make at a time? A. EPSON SX415 can make a maximum of 99 copies at a time. Q. What should I do if I miss the delivery of my EPSON SX415 ink cartridges? A. All our orders are delivered by Fastway Couriers. They will attempt to make two deliveries to your door and any unsuccessful deliveries will be returned to their central depot or to our warehouse. Any further delivery attempt will incur an additional charge of €4.95 inc VAT. Please contact us by telephone on 048 30833221 or email us at info@printerinkcartridges.ie to check your order status. Q. Does the range of cartridges you offer are good quality EPSON SX415 ink cartridges? A. Yes, we offer good quality of the range of cartridges, you can be sure that each print will be of the same quality at the last. We provide both compatible as well as original Epson cartridges for your printer. Epson’s innovative genuine Ink is developed and manufactured by Epson but are a bit expensive than the compatible ones that provides the same quality printouts. We recommend using only the good-quality EPSON SX415 ink cartridges because they use inks that are specially formulated to consistently produce photo quality prints and preserve the long-term reliability of Epson printers. The inks we supply guarantees the reliability of your printer and prolong its life. Q. How to uninstall a printer driver in Mac OS X? Q. How can I resolve the issue of missing colours or black printout problem? A. If the sections or lines in the printout are missing or if the printer does not print any ink onto the paper at all, this could be because of the blocked print head nozzles or usage of old or dried out EPSON SX415 ink cartridges. However, if the ink is printing onto the paper but the printouts are not in colour like black and white or sepia, this could be the result of a setting you have applied in your printer software or printing application. Perform a printer operation check to determine the type of print quality issue and then work for its solution. You can also refer to the online user manual for instructions. Q. Which cartridges are compatible with the Epson Stylus SX415? A.The Epson Stylus SX415 uses the T0711, T0712, T0713 and T0714 cartridge. There are options of using compatible and original cartridges for the printer, which are all readily available on our site. Q. Can the Epson Stylus SX415 fax as well as print? A.Unfortunately the Epson Stylus SX415 cannot fix, however, it has scanning feature and impeccable photo printing quality. Q. I wish to print quality photographs from a printer and was wondering would this printer be suitable. Thanks. A.The Epson Stylus SX415 is a perfect printer for high-quality photograph prints. There is Epson Easy Photo FixTM which allows the photo fixing of older prints, as well as easy printing for new photographs from a range of devices such as digital camera, memory card as well as PC. Q. Can I store Epson SX415 ink cartridges for a long time - as I was planning on bulk buy (to buy several packs) at suitable prices? A. The minimum shelf life of cartridges is about 6 months. The only risk to store the cartridges for a long time is that the ink inside will start drying up. If stored correctly in cool and dry place, and used before expiry date printed on the cartridges, Epson SX415 ink cartridges should work fine with your printer. Q. Can I use all black ink cartridges instead of the four different colour ink cartridges for Epson SX415 printer? A.No, the Epson Stylus SX415 printer uses colour specific slots. As it is a colour inkjet printer, you must install all 4 cartridges black, cyan, magenta and yellow correctly in their specific colour slots. Therefore, you can use only one black ink cartridge at a time, as other slots are intended for different colours and would not read the ‘chip’ correctly. Also for Epson SX415 Printer, it is necessary to have some amount of ink available in each cartridge in order for it to work. Q. Can I use compatible ink cartridges simultaneously with the genuine inks for EPSON SX415 Printer? A.Yes, our compatible ink cartridges will perform absolutely fine with the genuine Epson SX415 ink cartridges in the machine. You can simply replace the empty cartridge rather than replace them all at the same time, so you may find this way to be more cost-effective for the long term. Q. How can I refill the Epson SX415 ink cartridges? A.We don’t offer service to refill the ink cartridges. However, we do sell the genuine and compatible (refilled and recycled) Epson SX415 ink cartridges. We offer each colour separately (black - T0711, cyan - T0712, magenta - T0713 and yellow - T0714) as an ink cartridge and even a pack of four (multipack - T0715) which can cost you less than buying the ink cartridges individually. Q. Earlier, I've bought cheap inks for my Epson SX415 printer and they won't work, I think because they were chipped, so what happens if yours doesn't work? Are they returnable? A.We offer high-quality compatible Epson SX415 ink cartridges which are fully reliable and can be installed in the Epson SX415 printer. However, if you face any issue while installing it, feel free to call our customer support service on +44(0)28 308 33221 or email us on info@printerinkcartridges.ie and we will try to clarify your query. If this fails to get the cartridges working, or they appear to be faulty, we offer you a 30-day money back guarantee on our compatible ink cartridges. So, unless you get 100% satisfaction you can claim for a refund or replacement. Q. Where can I buy the Epson Stylus SX415 printer on this site? A.Unfortunately, we sell only ink cartridges for Epson Stylus SX415 printer. You should contact Epson directly and they should be able to advise you details on where you can purchase this printer from. Q. I want only single black cartridge and not a set for my Epson SX415 printer. Can I buy a recycled one? Q. Would this printer fit into my small office set up? A.The Epson SX415 is a basic multifunctional printer that offers high-quality outputs for printing and scanning both. It can be a good choice for home and small office users who are looking for a good quality printer for regular printing tasks. Epson SX415 is a low cost and stylish printing device, it weighs approx. 5.8kg and measures 450X342X182cm.